Rains and floods became so tremendous that people of southern Punjab and Chitral got effected by them. Monsoon season is going in Pakistan and in this regard we witnessed heavy rains, which caused flood in many areas of Pakistan. Chitral faced heavy food of all time which brought havoc in the area. “According to the reports we have received until now, 26 people have been killed in Chitral, three in Punjab and seven in Balochistan,” Ahmed Kamal, a spokesman for the National Disaster Management Authority (NDMA), told AFP. “Up to 350 villages have been damaged in Khyber-Pakhtunkhwa province and 422 in Punjab. An overall population of 250,000 has been affected due to floods,” he said. At least eight members of the same family were killed on Friday night in Chitral when their house was swept away in the gushing floodwaters, an official in Khyber Pakhtunkhwa said. A warning on its website said that the severe weather is likely to persist in the northern Gilgit Baltistan and Chitral over the next four to five days, and has the potential to produce more flooding. It prompted the Pakistani government to dispatch troops there to rescue those trapped by the flooding. The army says it is using helicopters to evacuate people from remote villages. 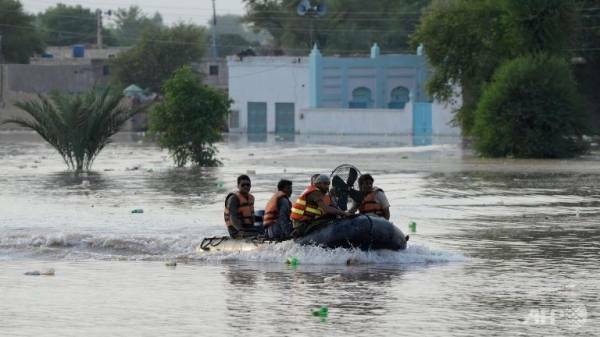 The flooding also has killed 12 people in Pakistan's southwestern Baluchistan province and in the country's eastern Punjab province. According to the National Disaster Management Authority, the floods in Punjab have affected about 200,000 people. The latest spell of rains, which started on Friday, is likely to continue for another two days in Pakistan. Floods triggered by monsoon rains kill scores of people annually in the country. Still we are unable to get some measures done for this sake. Punjab Disaster Management Authority also announced to prepare a report in this regard. Every year we face such situations and see politicians doing point scoring. When it comes to give relief to people, we cannot see much work.